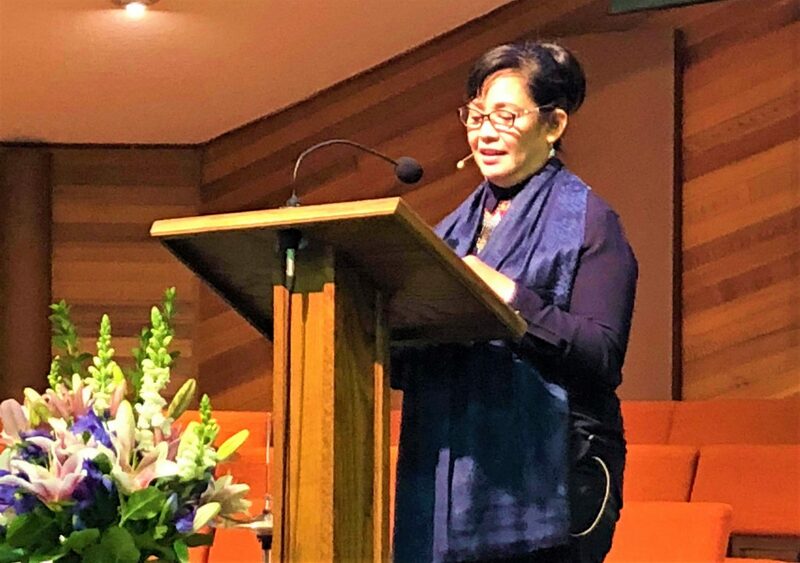 Joji shares the Word at Peace Mennonite Church during their morning worship service last Sunday, 04 March 2018. Richmond, British Columbia, Canada. As Mennonite Church Canada Witness Workers, Joji and I are expected to do Canadian ministry every two years. We have been doing this together since 2006. Except this time. Joji has to do this Canadian ministry alone, while I need to stay in the field. Joji has been an effective spokesperson for both PeaceBuilders Community and for Coffee For Peace. For the past few years, she has been our ministry’s ambassador to our national and international partners. In 23 October 2015, she represented us to the United Nations in New York to receive an award from the UN Development Program. In 24 August 2016, she was invited as a plenary speaker at a business conference organized by the Asian Institute of Management. In 10 September 2017, she received an award at the Association of Southeast Asian Nations Business Award. Earlier this year, she flew to Pennsylvania, USA to meet with prospective partners in inclusive business initiatives. Joji is also currently serving as chair of the Peace Commission, Mennonite World Conference. So, in coordination with Jason Martin, our new International Witness facilitator, we agreed that Joji would best represent this Mennonite Church Canada Witness’ long-term mission to the Philippines. I need to stay with our partners in Mindanao under Martial Law. Many of our partners from among the Indigenous Peoples (IP) in the field are struggling to keep their ancestral lands from the encroachment of big, powerful corporations. The corporations are mostly supported by the government. Our IP partners are now crying against abuses and human rights violations by both state and non-state armed groups. Our community feels we have to stand with our partners in these times of vulnerability and threat to their human rights and security. First, we’re helping in the documentation of the alleged atrocities by both the state security sector and non-state armed groups against civilians. Second, we help organize a broad coalition of civil society networks working for justice, security, and human rights to uphold civil liberties. Third, we accompany those affected by war and violence to the halls of power in Manila so that the values of justice, peace, and reconciliation would be heard in the process of legislation and policy-making. In the midst of these conflicts, we continue to do the organization of peace and reconciliation communities on the ground — from Northern Luzon, to the Eastern and Western Visayas, to Southern Mindanao. Please continue to pray for the safety of our local peace and reconciliation leaders from the sufferings caused by all who use violence to advance their cause. Shalom as you pursue justice and peace!